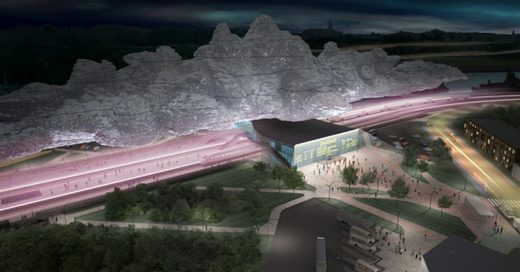 The project of the railway station in Sevastopol (Ukraine), made by Arthur Kupreychuk (Kiev, Ukraine), consists of a passenger terminal building and a hanging in the air cloud-canopy above it. The supporting structure of the canopy is similar to the structure of an airship. The canopy strives upward by buoyancy forces, if its average density is less than the density of the atmosphere. The shell is filled with helium. Guy lines make it stiff in the space. Aluminum frame consisting of longitudinal and transverse trusses makes the external form hard, the gas is inside a rigid framework in bags (cylinders) made of a gas-tight material, facing is made of fiberglass uniform panels. Passenger terminal building provides the simplest and shortest routes from the station square to the platform. Both of two main facades are made as display boards, for simplicity and clarity of orientation.